Shaker kitchens look almost too simple to even be considered a style, yet there’s something about their sleek yet practical approach that makes them one of the most sought-after styles out there. In today’s blog post, custom kitchen renovations expert DreamMaker Bath & Kitchen of Northeast Suburban Chicagoland provides a brief background on how Shaker kitchens came to be and how you can take some design cues from this iconic kitchen style. The Shaker style was conceptualized by a religious sect founded in England in 1783. Shakers believed that beauty rests in utility, which was reflected in their craftsmanship. Shaker kitchens are characterized by sleek, simple lines that are more functional than for show. The goal is modest and practical design. In short, just the essentials—no embellishments, adornments or anything that will distract from the precise craftsmanship. Shaker kitchens look great in just about any type of home, whether it’s modern or traditional. These kitchens were traditionally made from high-quality yet affordable wood. Today, almost any type of wood can be used. If you want to have a kitchen in true Shaker fashion, go for understated. 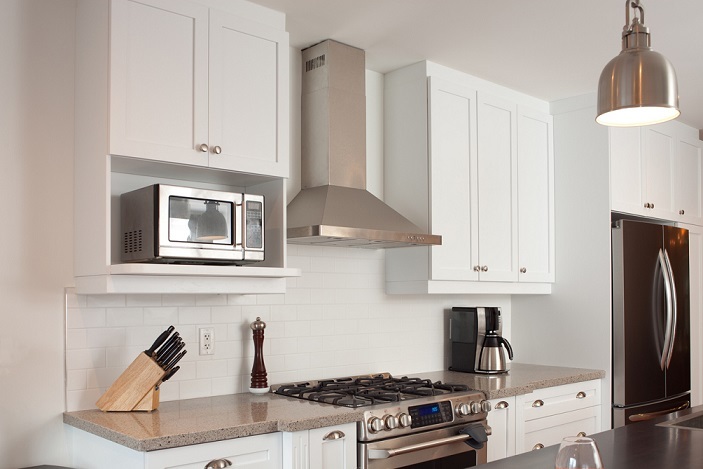 Shaker style cabinets have simple panels and matching hardware. When it comes to finish, you don’t have to go all natural. In fact, you can paint your kitchen cabinets in any color that will go with your home’s overall theme. For maximum visual impact, opt for deep colors like navy blue. There’s a reason we are one of the leading local kitchen remodeling contractors in the area. When you choose to work with DreamMaker Bath & Kitchen of Northeast Suburban Chicagoland, you can rest assured that you’ll end up with a kitchen that you love. Call us today at (847) 979-4474 so we can help you get started on your home remodeling project.